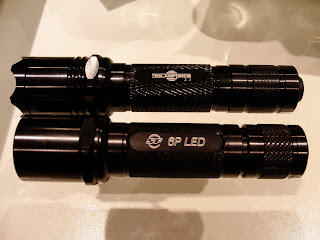 Surefire 6P on the bottom and Solarforce L2 on top. The Surefire 6P is ubiquitous, and for many people, instantly recognizable. It's known to be sturdy, dependable, useful and out of the price range of many. Chinese knock-offs to the rescue! But, Solarforce is not your typical chinese cloner, and the L2 is not a cheap clone (quality wise). Price: As low as $25.00 USD (often times including shipping) compared to the MSRP of the 6P, which is between $60-100 USD depending on the model. Options: Will accept any Surefire 6P or equivalent: bulb, tail cap, head, bezel and other accessories. 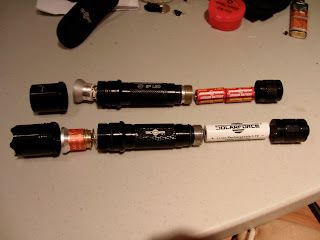 Option of different body tubes, for use with CR123s or rechargeable batteries. Pros: If you picked this up while blindfolded, you'd swear it was a 6P. The finish and feel are practically indistinguishable, and the ability to use real Surefire parts means that it is essentially identical. 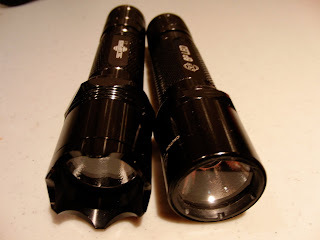 There are O-rings where the Surefire has O-rings, there are no burrs or botched parts, and the inside of the tube is nicely honed. 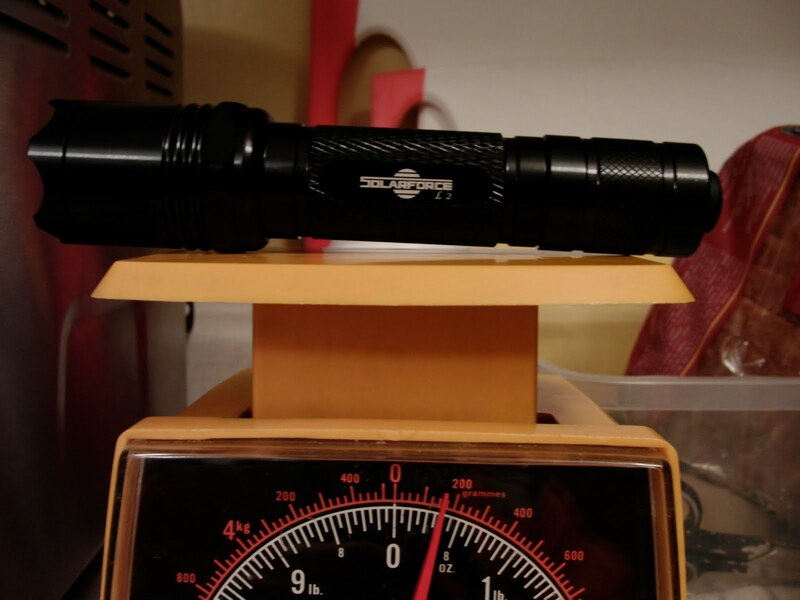 As a huge advantage over a stock 6P, some models (such as mine) can accept 18650 rechargeable cells, which not only save you lots of money over time, but also offer increased battery power for a brighter light. 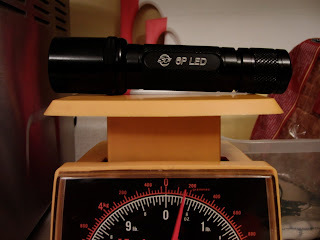 There is a myriad of accessories available, including pressure switches, super powerful LED bulbs (btw, a stock L2 will outshine a 6P significantly), and cool heads. All those things considered, it's dirt cheap (it's worth noting that I have heard more negative reviews about other 6P clones, including Spiderfire). Cons: You're not going to get any kind of warrantee or guarantee by being a Solarforce. 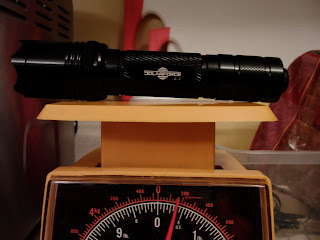 You have to weigh that risk against the low price of the torch. Some companies will say they're selling you a Solarforce, but will instead send you a Spiderfire, so there is an inherent risk there as well. 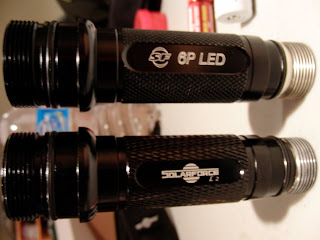 The stock bulb that comes with a Solarforce doesn't have the best finish on its reflector. Overall: Essentially identical to a 6P, and in a couple ways, superior in my opinion. The ability to use 18650s is a humongous advantage, and allows you to create a beastly customizable flashlight. And for $25.00, how could you go wrong? Special thanks to Pat for lending me his Surefire for this post.